Our condo and the area suffered very minimal damage, with the exception of our main central air conditioning. Until this is replaced, I have installed window air conditioners, which keep the apartment cool. Marbella del Caribe is a twin-tower hi-rise condominium located in the heart of the popular Isla Verde tourist section on beautiful Isla Verde Beach, the most spectacular beach in San Juan. Silky sand and gentle ocean waves on a one mile stretch of pristine beach front welcome you from every angle. The complex offers 24-hour security, beach access, and beautiful, private grounds that include a swimming pool, tennis court, volleyball/basketball court, playground, picnic tables and barbecues. The apartments are immaculately clean and fully furnished and equipped. In addition, each has its own private parking space on the premises. Marbella also has a beauty parlor and a mini market. There is a bus stop right in front of the building and in walking distance (2 blocks) is the elegant El San Juan Hotel and Casino, as well as several other hotels/casinos. There is a vast array of restaurants from casual to formal within a few short blocks. There are several supermarkets, numerous souvenir shops, Charlie Car Rental and a Walgreen's right across the street that is open 24 hours and has just about everything one could need from food, to beauty supplies, to beach gear. Experience the exciting nightlife, gourmet restaurants, or simply bask in the relaxed atmosphere. The perfect location for peace and quiet or a fun-filled, exciting vacation Isla Verde awaits you! Entrepreneur who owns 6 condos in Marbella del Caribe. Have been renting since 1988. Known for best apartments. I own 6 apartments in condominium Marbella del Caribe. I take excellent care of them, along with my caretaker, Esperanza. I travel to Puerto Rico every month from New York and stay in a different condo each time so that I can make sure they are all in excellent condition and are fully equipped and everything is in good condition. I have a reputation in and around Marbella as having the best apartments. I take great pride in these apartments and always want to make sure they are as advertised (in fact most people say that they exceed expectations. Already owned 5 units but was turning away many potential renters due to lack of availability. I knew it was time to purchase another condo. I've been going to Puerto Rico since 1968. I've stayed in many condos and hotels along the Isla Verde and Condado Tourist areas. I find Condominium Marbella del Caribe to be the best, by far. In fact, I've owned an apartment in another condo/hotel, but sold it so I could have all of my units in Condominium Marbella because they are the best kept and the staff are always friendly and helpful. 1. A quick flight from mainland U.S. 2. Part of the U.S. so no worries about foreign government, currency, etc. and no passport needed from the U.S. 3. Beautiful weather every day of the year. Average temp is 87 in the summer and 82 in the winter. 4. Clean and comfortable apartments that are well kept and updated often. 5. Isla Verde Beach is the most beautiful beach in San Juan and it is right out the back door. In addition, this location offers something for everyone...whether it be a quite vacation, or one with exciting night life, or one that offers wonderful tourists attractions, this condo is for you. Beautiful view of the ocean from the balcony, living room and bedrooms. Unlimited telephone service to the U.S. and Puerto Rico. There are plenty of sheets, pillows, blankets and comforters. There is a washer/dryer in the kitchen. Laundry detergent is supplied. OPTIONAL Parking in the underground garage for a fee. Ask owner if interested. There 're fitness machines on grounds in the back. The inside gym is in need of updating and currently closed. Living room with view of the ocean and pool, has a large flat screen HD/TV, stereo, DVR and enhanced cable (includes major networks and regular cable channels but not premium channels). Plenty of dishes and utensils. The kitchen is full service with a refrigerator, stove, microwave, blender, toaster, coffee maker, dishes, pots/pans, flatware, serving pieces and utensils. Full size dining table with seating for 4. In addition, there is a counter with 2 stools. Stereo radio with CD player. Balcony overlooking the beach and ocean. A balcony overlooking the beach. The on-grounds tennis court was damaged by Maria and in need of repair. Once it is fixed, the security guard must allow entry. A "rules" sheet must be signed prior to admittance to court. Large pool, suitable for laps, with divided low end area for children. The condo has strict rules for the pool. No food or drink is allowed. No game or running. Doorman on duty 24 hours. Smoking permitted on balcony only. No pets at any time. Chairs provided by pool area. Beach chairs and umbrellas for rent on beach. Walking distance to a wide variety of restaurants, including fast food to very high-end. Several hotels with gambling casinos within a three block radius. Very simple to get to. Extreamy clost to everything. Comfortable to host a family or a few friends. Apartment is super clean and has amazing views. All utilities are clean and work right. The fact that it has a washer dryer is awesome. 2 bathrooms makes it easy for everyone to get ready on time. It’s just the right place to stay. I will be back if I travel in a group again. Nice oceanfront condo with amazing views! This condo has everything necessary for an enjoyable stay in Puerto Rico. The unit overlooks the beach and pool. Both of which are excellent. There are beach towels and a small cooler provided which was very nice along with a washer/dryer. These may seem like little items but it’s nice to have these available vs packing them in suitcases! The window ac units cooled the rooms adequately. We did have a rental car so we utilized the parking garage underneath the building. This was our fifth trip to Puerto Rico and our first time staying in a condo vs hotel. We highly recommend this condo! It’s location is perfect and the ocean view is outstanding. Nora has done a good job creating a peaceful haven! The condo was just as pictured. The location was perfect, close to all we needed. Nora’s condo was neat and clean. The view was spectacular! The beach and pool were great. Wish the pool was open on Monday’s though. Anything we needed was right across the street at Walgreens. There were restaurants across the street too and in addition we were a short drive to amazing restaurants and old San Juan. Nora supplied thick, large towels and beach towels which was greatly appreciated . She even had our favorite family game, boggle, which we had fun playing. Any other supplies were very limited but easliy purchased. However, it would have been nice to have a couple beach chairs supplied in the condo and pens and paper. The air mattress was very comfortable! We had a wonderful stay!! We have stayed at the Marbella Oeste each summer for the past 7 years. We love Isla Verde beach, and the view is unbeatable. The condo is comfortable, and reasonably priced. Marbella del Caribe Condominium is right on Puerto Rico's spectacular Isla Verde beach, noted to be the best beach in San Juan. 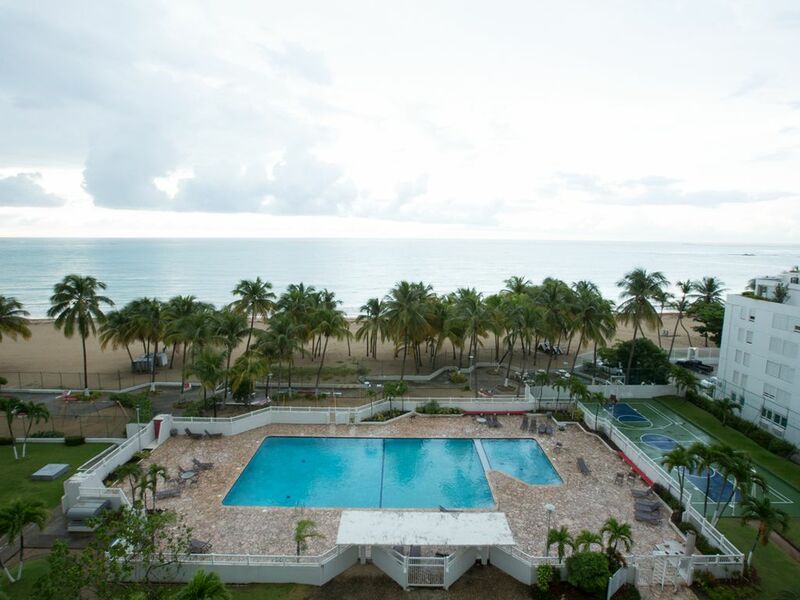 Located in the heart of the Isla Verde tourist area, we are in walking distance to restaurants, shopping and the fabulous El San Juan Hotel, as well as the Intercontinental Hotel, The Ritz Carlton Hotel and the Embassy Suites. Water sports, including jet skis, banana boats and parasailing, are available right on our beach in front of the St. Clare Mare. The complex offers 24-hour security, beach access, and beautiful, private grounds that include a swimming pool, tennis court, volleyball/basketball court, playground, picnic tables and barbecues. We are about 5 minutes from San Juan's International Airport: Luis Munos Marin Airport and only 15 minutes away from Condado and 20 minutes from Old San Juan. 1.) An optional reserved parking space is available for a fee of $25.00 which is good for the duration of the stay (not daily). Notify owner when requesting a reservation if the parking space is required. 2.) Once book, there is no cancellations for any reason. Trip insurance is recommended.